This classic recipe much like banana bread is to use up those super ripe bananas sitting on the counter. 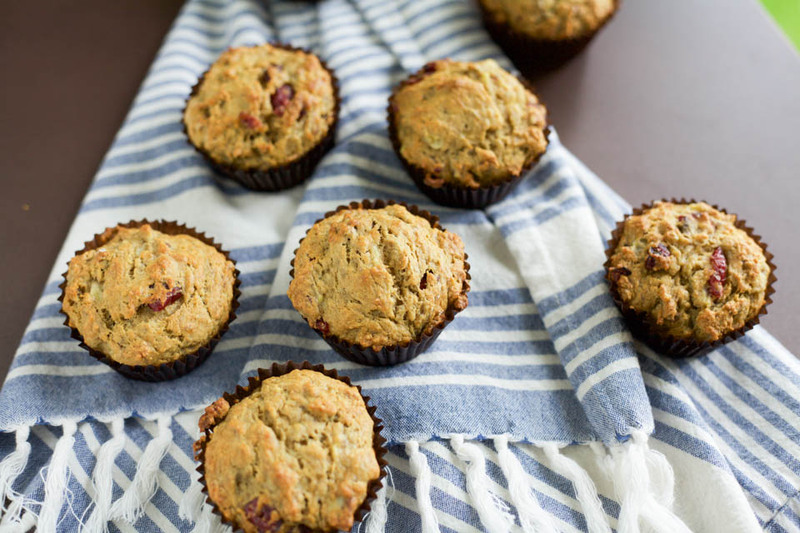 Bake these muffins, make a green smoothie or chocolate banana protein smoothie if you wanted to make something a bit more healthy :). I’ve got a few different ways to use those bananas, like freezing, but if they get too ripe it’s best to bake with them! 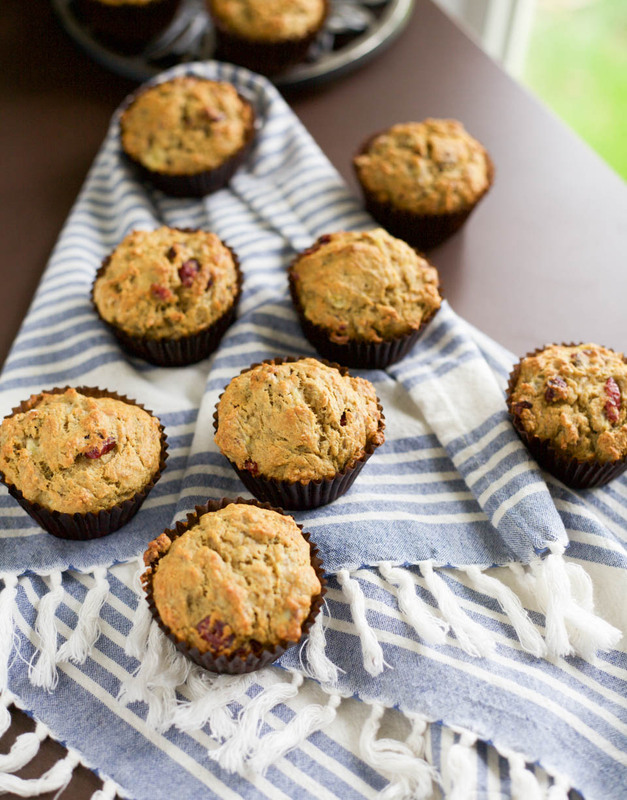 Who doesn’t love a super fluffy and moist Banana Nut Muffin anyhow? As with all of my baked goodies, these made their way over to my Mom and she loved them! I did something unusual and we were all fans, I added dried cranberries to one of the batches. I list it in the recipe below as optional but it worked really well if you like tart with sweet. 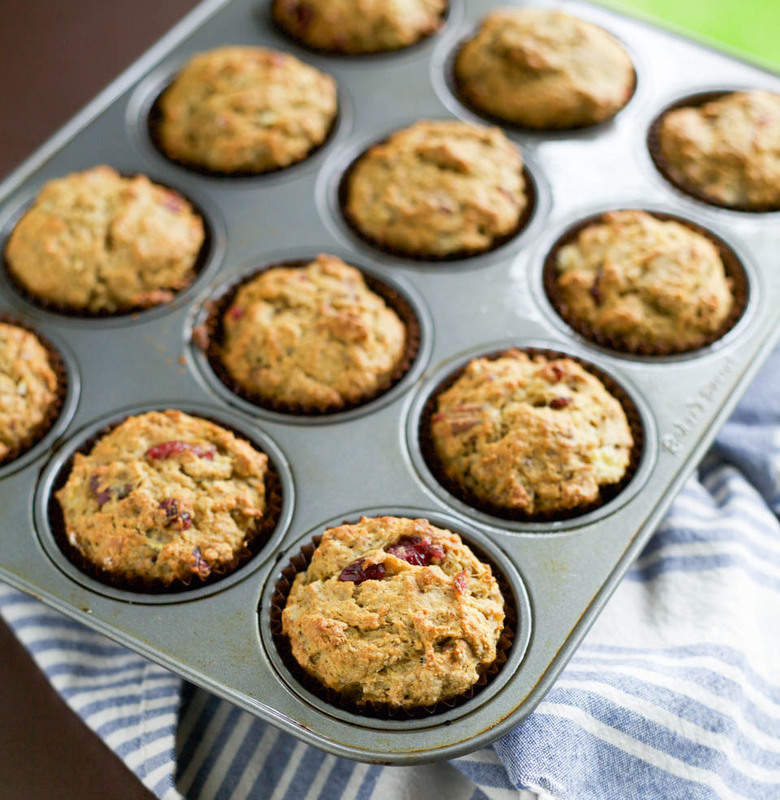 Bananas are super sweet already, a natural sweetener used in no sugar baked goods, so I opted to also optionally add maple syrup which works so well with bananas in muffin recipes. 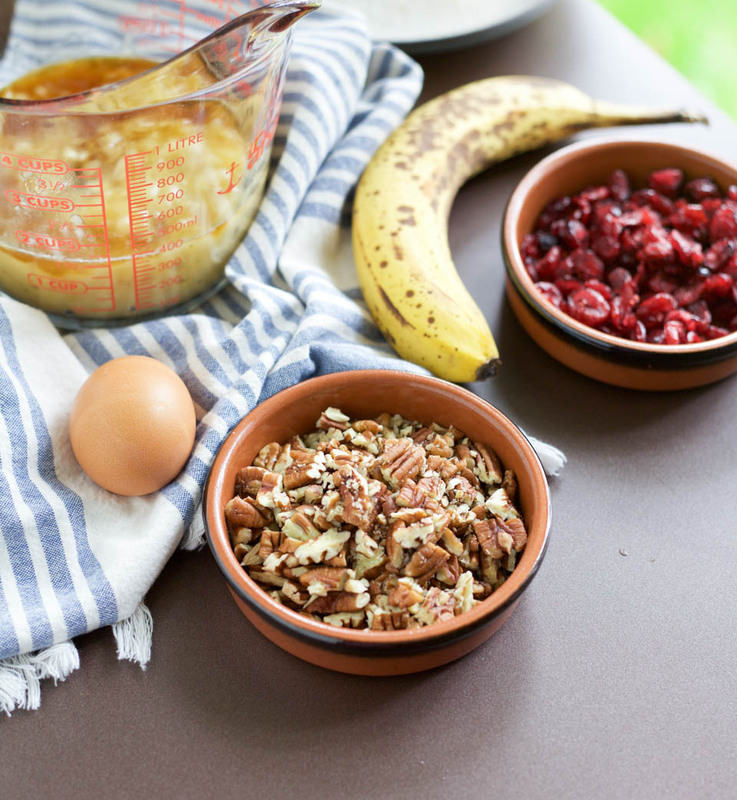 With that sweetness of the bananas, using a tart cranberry made sense, plus my Mom loves anything with nuts and dried fruit. I totally bake for her likes a lot of the time because they end up at her house lol :). The most important note when baking muffins or any recipe that uses only baking soda as the leavener, is to mix gently and get it into the baking pan as quickly as possible. As soon as baking soda is wet it releasing the gas to start leavening, that’s why muffins come out flat sometimes. So be gentle when mixing but move quickly ;). Place oven rack in center of oven, preheat to 350 degrees. Spray a muffin tin with baking/cooking spray, line with muffin cup paper if desired. Place flour, baking soda, and salt in a large bowl, whisk to combine well. Place mashed bananas, melted butter, egg, maple syrup, and vanilla extract in a medium bowl using a large fork, whisk to combine well. Add butter mixture to flour mixture, using a large spatula, very gently fold to combine, do not over mix. Add nuts, dried fruit if using, fold into batter using the spatula, very gently. 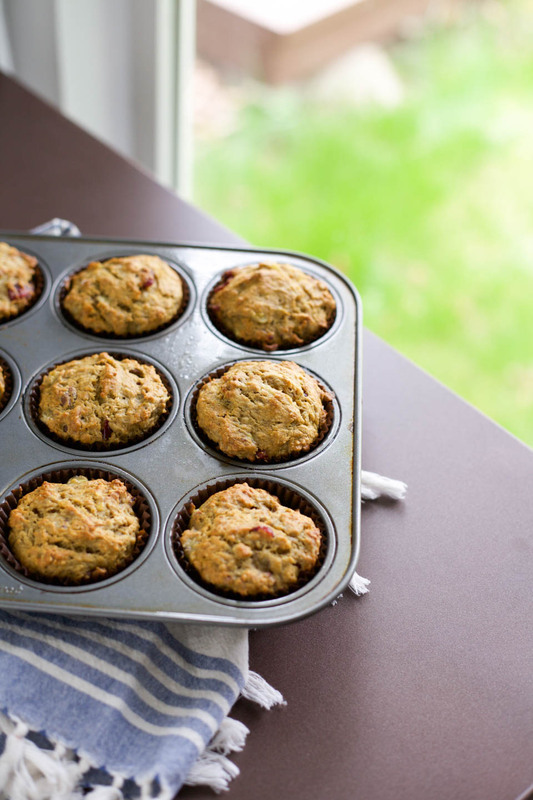 Fill muffin tin with batter using a 1/4 measuring cup about 3/4 full. Place in oven and bake for 20 minutes or until toothpick comes out of center clean. Allow to cool for 5 minutes, remove from pan and allow to cool for 30 minutes on a cooling rack. Store in an airtight container for 3 days on counter. Or store in a ziplock bag in freezer for up to 1 month. Remove and allow to thaw overnight on counter to enjoy in the morning. Hey Fabi, Next time you are in Providore stop at Flyhng Fish where my son-inlaw, Justin Ashby resently became manager. Hi Graham! I hope you are well. Oh that is awesome, will do.